SteamFunk, CyberFunk, Afrofuterism, Oh My! Our Top Reasons to Funk it Up at BLACKTASTICON 2018! 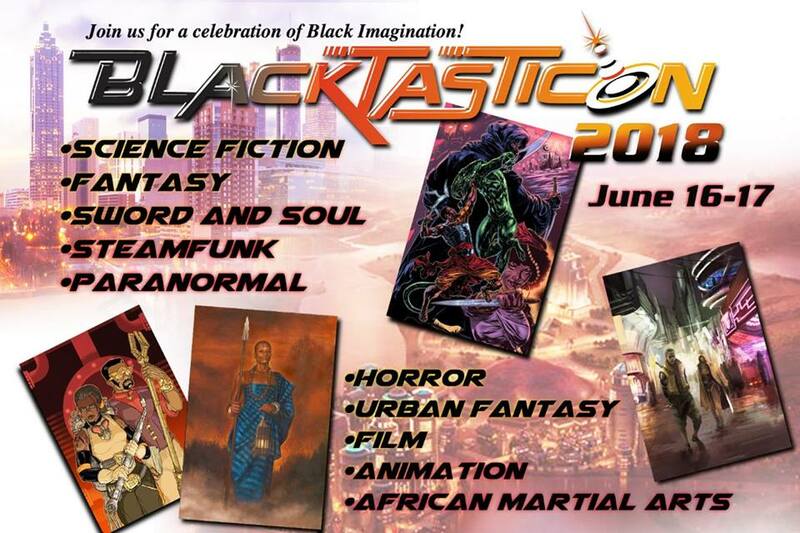 BLACKTASTICON 2018 shouts “Welcome to the Future!” as co-founders Kool Kat Balogun Ojetade and Milton Davis bring you, Atlanta’s top-notch spec-lit convention (formerly The State of Black Science Fiction Con), this Saturday and Sunday (June 16-17) at GA Tech’s Ferst Center. This event is chock full of Afro-futurism, steamfunk, cyberfunk, dieselfunk, sword and soul, rococoa, Afrikan martial arts, and then some! Come see why we think you should come on out and celebrate the diverse and ultra relevant voices of current Black writers, artists, filmmakers, and creators of all kinds delivering some of the most dynamic and ground-breaking speculative fiction today! 1) THE MAHOGANY MASQUERADE. Get your steamfunk, dieselfunk, Afrofuturism fix as BLACKTASTICON kicks off the weekend with a night of funktastic shenanigans! Get gussied up cosplay-style (or don’t, your choice) and boogie down to the Auburn Avenue Research Library on African American Culture & History Friday, June 15 from 6-9pm! 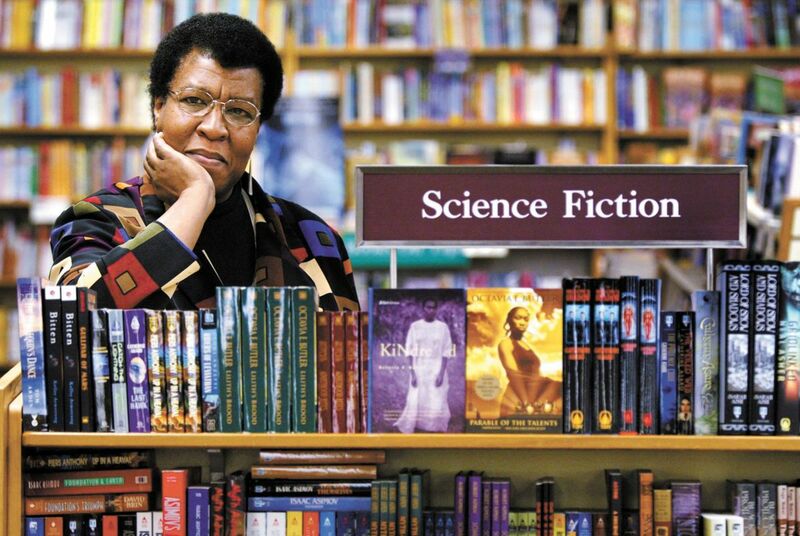 2) PATTERNMASTER: THE LEGACY OF OCTAVIA BUTLER. 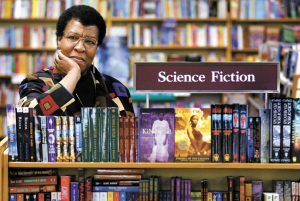 Multi prestigious award-winning (Hugo and Nebula Awards to name a few) “Grand Dame of Science Fiction”, Octavia Butler’s life and legacy is the sole focus of this much-anticipated event. Come celebrate one of the most influential Black Science Fiction writers with poet and author Linda D. Addison, Guest of Honor/author Sheree Renee Thomas, Guest of Honor/artist John Jennings, author Troy L. Wiggins and author/screenwriter Kenesha Williams, Saturday at 12pm. 3) WOMEN IN BLACK SPECULATIVE FICTION. The WBSF panel, a.k.a. “2016’s most popular panel” (standing room only!) returns and with good reason. 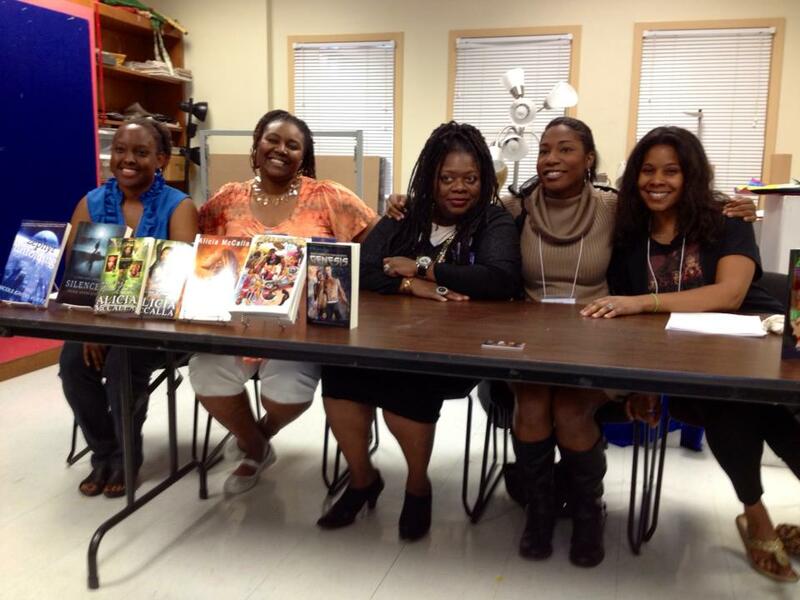 Explore the roots of Black Women in Speculative Fiction while celebrating the Black women authors, publishers and more with one helluva line-up featuring author/publisher Kool Kat Nicole Givens Kurtz, poet/author Linda D. Addison, author Sheree Renee Thomas, author Valjeanne Jeffers, author/screenwriter Kenesha Williams and author Christine Taylor-Butler, moderated by Kool Kat and BLACKTASTICON co-creator Balogun Ojetade, Saturday at 4:30pm! 4) THE RENAISSANCE: FROM HARLEM TO SATURDAY MORNINGS. Who doesn’t love comics, cartoons and animation? Roosevelt Pitts Jr., a thirty-plus year comic book industry vet and creator of PURGE, hosts this riveting exploration of the Black independent comic book scene, along with Guest of Honor/artist Mshindo Kuumba and Author Heru. 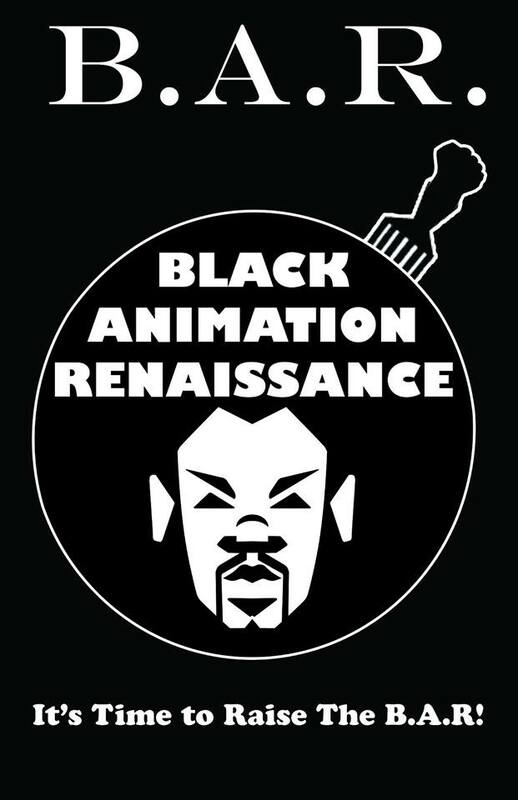 Get ready to dig deep into the industry’s checkered past of Black representation in the animated medium and the exciting future that awaits generations to come, Saturday at 4:30pm! 5) FROM BLACK PANTHERS TO THE BLACK PANTHER. 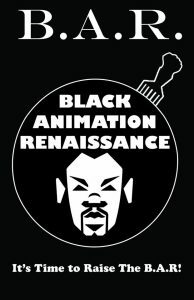 If you missed the historic event this past March, now’s your chance to experience a powerful discussion on the history, impact, importance and need for Creative Resistance and Heroic Black Imagery in film, fiction and artwork. Join authors, activists, actors and Hip Hop icons along with hosts and BLACKTASTICON co-creators Balogun Ojetade and Milton Davis, Saturday at 2pm! 6) LINDA D. ADDISON. Guest of Honor, Linda Addison is a poet and writer of horror, fantasy and science fiction. 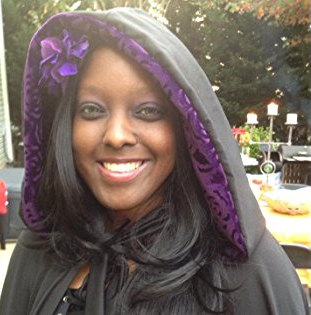 She is the first African-American winner of the HWA Bram Stoker Award, which she won four times for her collections CONSUMED, REDUCED TO BEAUTIFUL GREY ASHES (2001); BEING FULL OF LIGHT, INSUBSTANTIAL (2007); HOW TO RECOGNIZE A DEMON HAS BECOME YOUR FRIEND (2011); and FOUR ELEMENTS (2014). She was also recently announced the winner of the HWA Lifetime Achievement Award. 7) FROM ROMANCE TO THE VAMPIRE HUNTRESS. Celebrate the life and legacy of author L.A. Banks, known for creating diverse perspectives in horror, sci-fi, fantasy and romance. She was also involved in the creation of the popular television series, TRUE BLOOD. Catch this riveting panel discussion of the life and continuing influence of Banks with author K. Ceres Wright, author B. Sharise Moore, Diane Williams, author Stafford Battle and William Jones, Saturday at 3pm. 8) IRON-AUTHUR. Let the wild rumpus start! Witness five authors compete for the title of IRON-AUTHOR, in the vein of IRON-CHEF (5 authors. 5 rounds. 5 minutes. 5 stories). Authors will have a chance to turn five Mystery Ingredient Words into a Science Fiction, Horror, or Fantasy short story in less than five minutes per round. Who will reign supreme? Get competitive on Saturday at 12pm! Blacktasticon main con hours are Sat. June 16 from 10 a.m. to 10 p.m.; Sun. June 17 from 10:30 a.m. to 6:30 p.m. For more info, visit the BLACKTASTICON official website here. 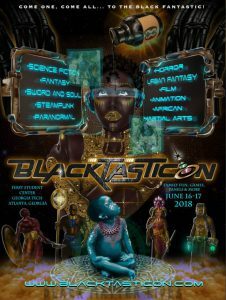 The State of Black Science Fiction shouts “Welcome to the Future!” as co-founders Kool Kat Balogun Ojetade and Milton Davis bring you BLACKTASTICON 2018, Atlanta’s top-notch spec-lit convention (formerly known as The State of Black Science Fiction Con), this Saturday and Sunday (June 16-17) at GA Tech’s Ferst Center. This event is chock full of Afro-futurism, steamfunk, cyberfunk, dieselfunk, sword and soul, rococoa, Afrikan martial arts, and then some! So come on out and celebrate the diverse and ultra relevant voices of current black writers, artists, filmmakers, and creators of all kinds delivering some of the most dynamic and ground-breaking speculative fiction today, including our Kool Kat of the Week, Nicole Givens Kurtz. Kurtz, Dream Realm, EPPIE and Fresh Voices in Science Fiction award finalist, delves deep into the speculative literature genre (sci-fi, horror, weird westerns, urban fantasy, etc.). Her short stories have been published in thirty plus anthologies including “KQ” (LOST TRAILS: FORGOTTEN TALES OF THE WEIRD WEST, VOL. 2 – wild west/horror), “Death’s Harvest” (STREET MAGICK ANTHOLOGY – urban fantasy); “Kanti’s Black Box” (THE MARTIAN ANTHOLOGY – science fiction), just to name a few. Kurtz is also the mastermind behind the CYBIL LEWIS and MINISTER KNIGHTS series. In addition to her prolific writing career, Kurtz is publisher and owner of Mocha Memoirs Press, brought to life in order to bring more diverse voices to the land of speculative fiction. ATLRetro caught up with North Carolina-based writer and frequent Atlanta visitor, Nicole Givens Kurtz, to find out more about her influences, her career in spec-lit, the need for diversity and representation, and the importance of BLACKTASTICON. 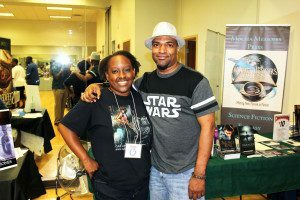 ATLRetro: The first annual State of Black Science Fiction Convention was a hit with over 500 attendees and 40 vendors. 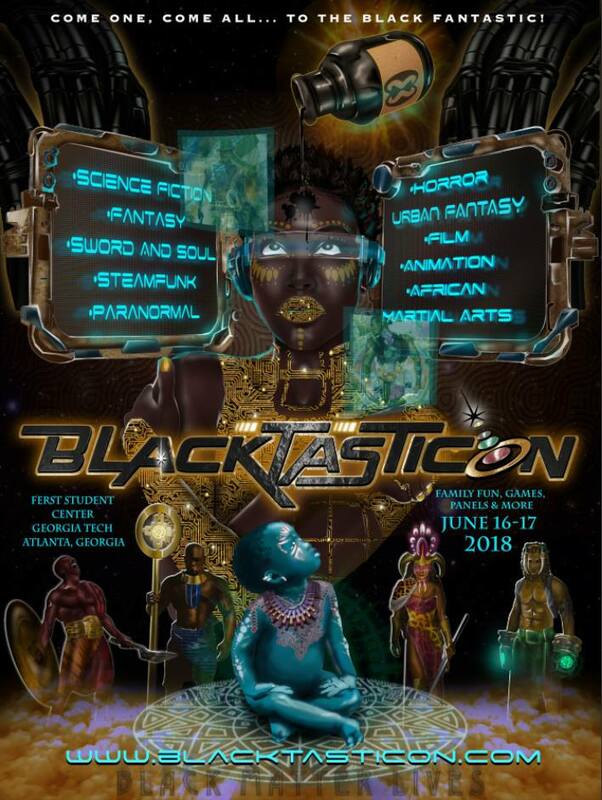 Atlanta welcomes it back for another exciting year as Blacktasticon 2018 invades the south once again! As a guest and panelist at last year’s event, can you tell us a little about your experience and what you hope to gain this year? 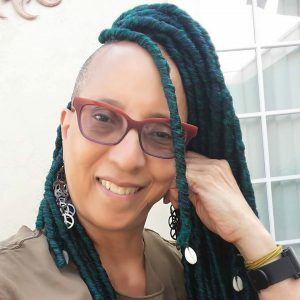 Nicole Givens Kurtz: The first annual State of Black Science Fiction Convention was an awe-inspiring event. It also felt like a homecoming. Many of the people there I’ve known virtually via social media. There were hugs, laughter, and a great deal of support. One of the beautiful things about the convention resided in the warmth and promotion of black science fiction. It was ours. Here we were not the fringe of the convention, but the center, its heart. That paradigm shift hit me hard, and there were times when I looked out at the sea of black faces–faces like mine–that I wanted to weep in joy. I’ve never felt so included in a convention before. Blacktasticon welcomes us to the future, a boundless and complex yet beautiful future. With the current state of politics, of the #metoo movement, of the societal woes and bloody wounds still saturating the present-day, what message do you hope current writers and creators bring to the table for future generations? The overriding message I hope Blacktasticon delivers to future generations is that we (African-Americans) aren’t going anywhere. The future is full of black people, including women. We are a creative force, in all aspects of media, comics, movies, novels, and animation. This convention shows the future generations what we are capable of and what they can do. Those creative doors aren’t shut to them because of traditional gatekeepers. This goes beyond simply diversity, but the nuisances of the black collective. African-Americans aren’t a monolith, and here at this convention, all of those various talents are displayed. Do you feel it is the job of artists, writers and creators to represent what this world should be and could be? If so, which speculative fiction writer past or present would you say represents the most comprehensive ideal of how the world and its inhabitants should be? Science fiction has always been political. Mary Shelley‘s FRANKENSTEIN is an absolute novel about hubris. So, yes, I do feel it is our job to tell stories, as humans have done since the beginning of time, since before written language. We tell stories to explain the world around us. That’s the role of artists, writers, and creators to continue to tell those stories, including what the world should be and what it could be. Past fiction writers that I feel offered the most comprehensive ideal of our world are classics such as Octavia Butler, Ray Bradbury, Ursula LeGuin, Zora Neale Hurston, and of course, Mary Shelley. There are modern writers of science fiction and fantasy who are representing the world as is or how it could be as well. N.K. Jemisin, Daniel Jose Older, Max Gladstone and anyone at Rosarium Publishing is presenting fabulous visions of the future. Can you tell us how you got started writing? Did you start writing as a little girl? Or were you older when the writing bug bit you? I’ve been writing stories before I could actually write words. When I was little, I would go up to my room and continue the stories I saw on television with my dolls or in my head. Once I learned to write, I would scribble the stories down, but it wasn’t until high school where I won a district wide essay contest that I realized I could make money from writing. I read everything I could get my hands on from elementary school onward. My mother encouraged me to keep reading and we spent many weekends at the public library checking out books. When I became a teenager, I would skip the mall and spend my Saturday buried in books, gaining knowledge, and losing myself in other worlds. 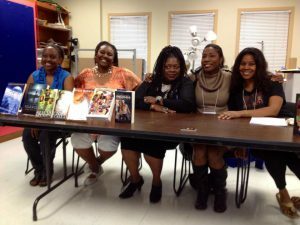 Your Mocha Memoirs Press mission statement is “We believe representation in speculative fiction (science fiction, horror, fantasy) is not only important, but a necessity.” Can you tell our readers a little bit about Mocha Memoirs Press, LLC, and why you feel representation is essential? Mocha Memoirs began as a way for me to funnel more diverse works into the world, where at the time, I saw a huge gap. The company began in 2010, and at that time, I did not see vary many science fiction works that reflected people of color, women, or black women in particular. Often when I attended conventions with my first novel, I was the only black person there at all, let alone actually selling my published novel. In an effort to give back but also bring awareness to the diverse stories we can tell, I started Mocha Memoirs Press. Representation is essential because it provides positive self affirmation. Essentially, seeing oneself in media as a hero, heroine, or protagonists demonstrates to the reader/viewer, “You matter. You exist. This future is yours and you have a place in it. This story could be your story.” Everyone wants to be valued. Representation should reflect the diversity of our world. We see that you’ve had work published in LOST TRAILS: FORGOTTEN TALES OF THE WEIRD WEST, LAWLESS LANDS, and STRAIGHT OUTTA TOMBSTONE, to name a few. Can you tell us about your love of westerns (the weirder the better) and how living in New Mexico influenced your writing? Prior to moving to New Mexico, I lived in a variety of other places (San Diego, Chicago, Louisville) but nothing took root inside me the way the Land of Enchantment did. My mother was always a western fan, and in our household, I grew up with Clint Eastwood, SHANE, and THE RIFLEMAN. To this day, my mother still sits and watches westerns. Imagine a young black girl in a housing project watching these men settle scores with the fastest pistols in the west. As a writer, my weird western stories are rooted in the theme of freedom. This place, the west, specifically, the southwest, thrived with a diverse group of people–Native Americans, Chinese immigrants, freed slaves, and of course, wealthy Eastern whites; each having to work together to scrape out a life in this harsh, new environment, and in doing so crafted an entirely different way of life, of culture, unlike those in the East. Those differences still resonate through to this day. That’s why I write weird westerns. You’ve had short stories published in over thirty anthologies ranging from science fiction to horror and have had your novels become finalists for several awards, such as the EPPIES, Dream Realm and Fresh Voices in Sci-Fi. If you had to choose a favorite short story or novel from your bibliography, which would you choose and why? This is like asking me to pick my favorite child! Of all the short stories I’ve written, “Belly Speaker,” is my favorite. It’s my favorite because it is a weird western, but it is about finding one’s voice when others threaten to silence it. 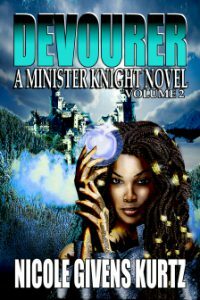 My favorite novel, of the ones I’ve written, is DEVOURER. In this second MINISTER KNIGHTS OF SOULS novel, Akub seeks to redeem herself from her violent past by doing something criminal. I’m interested in redemption and how we overcome the actions of our past. Which writer from the past and which writer from the present has influenced and continues to influence you the most and what is it about them that draws them to you? The writer from my past that influenced me the most is Stephen King. Most of my stories have their roots in weird, strange horror. Even if they’re science fiction stories, horrific things happen in them. Robert B. Parker, Sue Grafton, Zora Neale Hurston, and classic literature such as Shirley Jackson, Alice Walker, and of course, Octavia Butler have all influenced me. Having had the pleasure of experiencing your panels at last year’s convention, we know you’re not only a killer storyteller, but you’re also a spooky horror film junkie and fanatic like us! Can you tell us your favorite horror movie and why it ranks at the top of your list? My favorite horror movie of all time is MY BLOODY VALENTINE, the remake. Don’t judge me! Prior to that movie, my favorite horror films were from the 1980s: LOST BOYS, FRIGHT NIGHT and HELLRAISER. I still watch these films on streaming media whenever I need a good scare. As a writer working in the science-fiction, fantasy and horror genres, what challenges have you personally faced that seem to be a common theme among women, especially women of color in the industry? When I began my career in science fiction publishing in 2005, the challenges were getting past the gatekeepers at major publishing companies to even look at my work. So many rejections of “Cannot identify with this character,” and “Nice concept, can’t sell it.” The perception that black protagonists wouldn’t sell or that readers who weren’t black couldn’t identify with a non-white protagonist in science fiction was astounding to me. This same genre where people could identify with shapeshifting tigers, but not another human being, continues to be the drumbeat for certain editors and publishers today. The difference today (14 years later) is the convenience of small press publishing, electronic book publishing, and self publishing options that allows my work to by-pass some of those gatekeepers. Conventions like Blacktasticon help me market and connect to readers who are hungry for those stories. Can you give us five things you’re into at the moment that we should be watching, reading or listening to right now— past or present, well-known or obscure? Five things I’m in to right now are: 1) CLOAK & DAGGER on Freeform/Hulu; 2) ALTERED CARBON-the series with Kovacs is a good cyberpunk series; 3) Sting’s TEN SUMMONER’S TALES is always in rotation; 4) Andrea Botticelli is also in heavy rotation; and 5) ROUTE 3 by Robert Jeffery is a comic series that I’m eagerly awaiting the next installment. Any advice for women writers out there trying to get their foot in the door? DO.NOT.SETTLE. I wish I would’ve stuck to this advice at the onset of my career. Don’t settle. Do your research because this business requires a great deal of patience. Know what you want and do not settle for anything less. Getting back to what brought us here, Blacktasticon 2018! Is there anything exciting you have planned for attendees? Can you give us a sneak peek into the panels you’ll be sitting on? My press, Mocha Memoirs, will have special package pricing just for the convention. I’m on the Women in Black Speculative Fiction panel, which I’m very excited to be a part of again. Last time we had standing room only! And last but not least, what are you currently working on and how can we get our hands on it? I’m currently working on finishing a novella, that’s romance and fantasy. 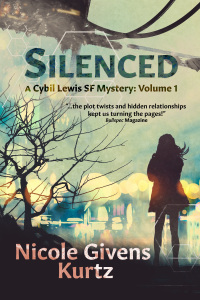 Afterwards, I’m diving back into my Cybil Lewis Science Fiction Mystery series. Then later this year, I’ll be working on my weird western short story collection. Photos courtesy of Nicole Givens Kurtz and used with permission. Catch up with our Kool Kat of the Week, Michael Wehunt, and a plethora of other Weird and speculative fiction writers at the inaugural The Outer Dark Symposium on the Greater Weird, crash-landing at Decatur CoWorks on Saturday, March 25, and proudly sponsored by ATLRetro. And eat, drink and exchange oddities with the writers during The Outer Dark Symposium Pre-Party at My Parents’ Basement, Friday, March 24, 8-11 pm, where you also can gather ‘round for readings by Michael Wehunt, our own publisher and bloggeress in charge Anya Martin (“The Un-Bride or No Gods & Marxists,” Eternal Frankenstein) and Selena Chambers (World Fantasy Award nominee for “The Neurastheniac,” Cassilda’s Song). 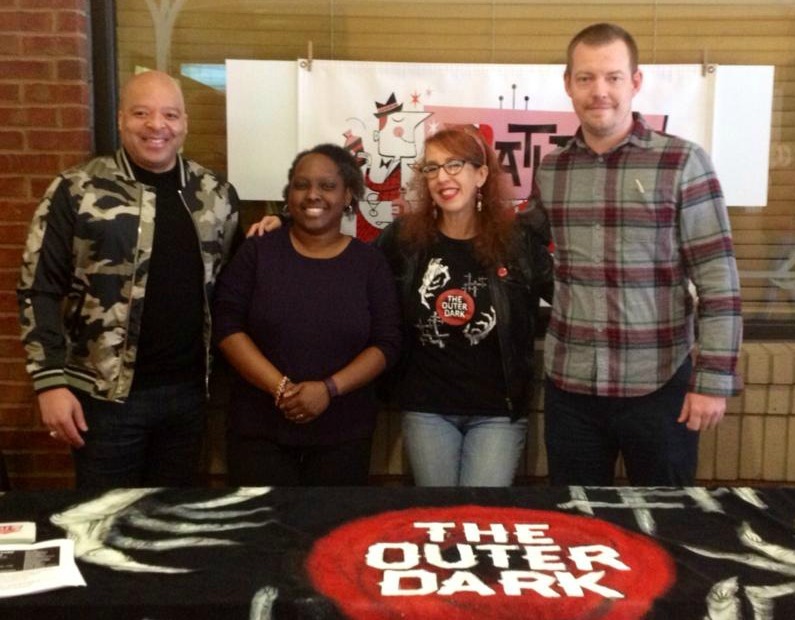 The Outer Dark Symposium is brought to you by The Outer Dark podcast and its host This Is Horror! and features eight hours of panels, readings and signings centered around Weird and speculative fiction. Admission will be limited to 50 attendees, but all programming will be featured on The Outer Dark. Other confirmed guests include Daniel Braum (Night Marchers and Other Strange Tales), Gerald Coleman (When Night Falls: Book One of The Three Gifts), Milton Davis (From Here to Timbuktu), Kristi DeMeester (read her ATLRetro feature here where she discusses her upcoming novel Beneath), John C. Foster (Mister White), Craig L. Gidney (Sea, Swallow Me and Other Stories), Orrin Grey (Painted Monsters and Other Strange Beasts), Valjeanne Jeffers (Immortal), Nicole Givens Kurtz (The Cybil Lewis Series), Edward Austin Hall (co-editor of Mothership: Tales from Afrofuturism and Beyond), Scott Nicolay (World Fantasy Award winner for “Do You Like To Look At Monsters?”), Kool Kat Balogun Ojetade (The Chronicles of Harriet Tubman: Freedonia), Eric Schaller (Meet Me in the Middle of the Air), Grafton Tanner (Babbling Corpse: Vaporwave and the Commodification of Ghosts), and Damien Angelica Walters (Sing Me Your Scars). Wehunt, a transplant from North Georgia (just a stone’s throw from the Appalachians), has set up roots in the lovely urban weirdness that is Atlanta. 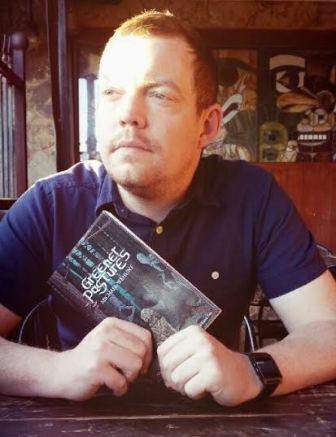 His short fiction has appeared in Cemetery Dance, The Dark, The Mammoth Book of Cthulhu: New Lovecraftian Fiction, The Year’s Best Dark Fantasy & Horror, and Year’s Best Weird Fiction, among others. 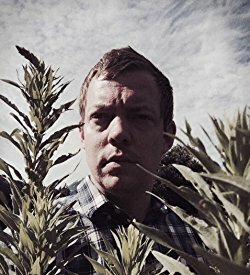 His debut fiction collection, Greener Pastures, was published in 2016, and he’s currently working on his first novel, which is sure to please the maniacal masses. ATLRetro caught up with Wehunt for a quick rundown on what inspires him to put pen to paper, his admiration for the truly bizarre and why you should always follow your dreams, no matter how weird. ATLRETRO: It’s the usual state of things for a writer, or any artist to be honest, to be pigeonholed into clear-cut tried-and-true genres. Your work has been described as horror, weird horror, sci-fi, all wrapped up in a bizarre Southern Gothic blanket filled with the strange and bizarre. What are the pros and cons of being classified in such a way? And do you feel it’s better to not quite fit in any specific genre? Michael Wehunt: I definitely prefer not fitting into any one tidy box. It really depends on an author’s ultimate goal, however. Sometimes the best way to make a name for oneself and become commercially successful—often a pipe dream, but what else are dreams for?— is to willingly climb into that single genre box. Your brand, so to speak, can be conveniently labeled. In my opinion, the label on the box is for the readers, not the author. But mixing genres is wonderful, too, and can have its own rewards. I likely won’t ever be a chameleon type of writer, using a wholly different form each time out. Instead, I’m more focused on that section of the Venn diagram where all these different areas overlap and exploring what’s there. The convergence could be subtle here or it could be stark there. Ultimately, these elements all serve the same purpose. We see that you’ve had a long (and hopefully torrid!) love affair with Flannery O’Connor, the mother of grotesque discomfort. What is it about her tales and her writing that inspires you the most? Flannery O’Connor was my third literary love. I discovered Stephen King when I was 8 years old, then Poe shortly after. It wasn’t until early in high school that I was introduced to O’Connor—and later still to Southern Gothic in general— and all these years later I’ve yet to read an author who could find that seam between ugliness and transcendence so perfectly. There are other authors who write beautifully in a Southern voice—Carson McCullers!— but none like she did. She mined the deep-running spiritual power of the South and smelted it with the grotesquery of petty humanness, and horror, black humor, and great beauty emerged in her work. Much later—only a handful of years ago, in fact—I would immerse myself in weird fiction and discover another love of my life. Robert Aickman and Algernon Blackwood, alongside contemporary authors such as Lynda E. Rucker and Laird Barron, showed me that O’Connor had been frequently writing a sort of weird fiction, though she was never credited with such. The only difference was that the spirituality in her work was the sort that America embraces, and it was all the more powerful to show what was under its rock while still remaining devout. The same cosmic strangeness is often right there in her books—why would we think our minds can fathom God with a capital G, after all—and this only deepened my love for her…and, yes, made it more torrid. Stereotypically, the south, or “southerners” to be exact, is known the world over for its ability to bury deep dark secrets while flaunting its ignorance with a discomforting ease. How important would you say is the written word when it comes to exposing societal atrocities and do you think it is a writer’s duty to bring about change through their published works? The South has a large closet filled with skeletons, to be sure, and the metaphor is uglier than it would be in most other cases. Not only have slavery and the foul mistreatment of Native Americans been largely papered over in our history books—not ignored, of course, but spruced up to look less unattractive—but poverty and the machine that perpetuates poverty bring out the worst in people sometimes, and a fierce sense of piety and Southern pride can sweep these things under the rug with a defiant pride. The word “demure” comes to mind. That rug has been peeled back even more in recent years. Not just in the rural South but in other analogous areas of the country. And things are squirming in the light. Fiction can be escapism, pure and simple. It can be socio-political in a direct way or in an indirect way. It can focus on philosophy and ideas. It can examine what it means to be human, with all a human’s transcendence and trappings. It can be one of these things or it can be all of these things at the same time. The best of it makes you think about the world without really letting you know it’s doing so, and in that way, change can come simply by engaging the reader with the self and then with the world around them. I know that much of my worldview (and self-view) came from reading dark fiction, and it’s no coincidence that compassion and kindness are the things I seek out in a political candidate or organization or friend. Your debut collection, GREENER PASTURES, was published in 2016. Can you tell our readers a little about the collection and what inspired you to put together these particular tales in one grouping? 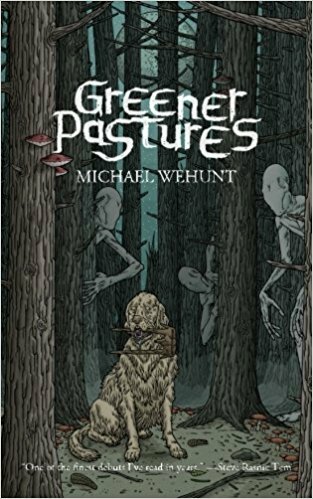 Greener Pastures contains 11 of my favorite short stories as of late 2015; those I felt worked the best together to carry a general theme while also providing just enough variety in subject matter and tone. When they were all together, I realized how prominently trees figure into my work, something I’d never truly noticed before. They’re everywhere, either in the foreground or background, but this was mostly accidental. Less accidental was the theme of loss. There are a lot of stories here that deal with various shades and types of loss, and how people cope with it. Write what you fear, they say, and that’s exactly what I fear. But I wanted a variety of moods and voices to bear these losses and keep things interesting for the reader. And, of course, a variety of darkness, including some good old-fashioned terror. In the end, I would say most of these stories speak from and of the human heart. There’s nothing suppler and earthier than humanity. I plan to dig in that dirt as long as people will let me. I’ll do my best to scare and unsettle them while I’m at it. 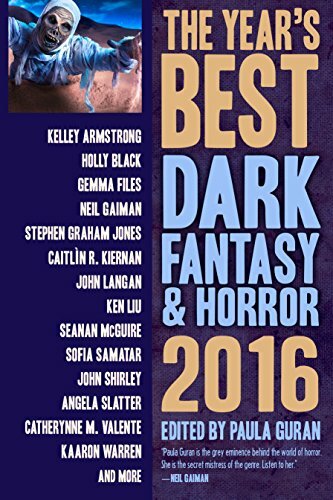 We’re also excited to see that your story, “October Film Haunt: Under the House” is featured in THE YEAR’S BEST DARK FANTASY & HORROR 2017 collection. Can you tell us a little about what inspired you to write this story and what it means to you to be a part of this collection? Thank you! This will be my second time in Paula Guran’s yearly best-of-the-dark-stuff anthology, and I feel very grateful and fortunate for that. “October Film Haunt: Under the House” is an interesting and special story for me. It has two origins: The first is that I wanted to write a love letter of sorts to horror and weird fiction fandom. Four guys from different walks of life who met at a fan convention and found a common passion for horror films take a road trip once a year to the setting of a famous scary movie, documenting their findings and sensations. Since I’m a sucker for the found-footage genre of horror (à la THE BLAIR WITCH PROJECT), I wanted to try my hand at translating this medium into the written word, only switching into video camera mode when the story earned it. But I also wrote it specifically as a reaction to the majority of my work dealing with, as alluded to above, emotion, grief, and the joys and pains of being a regular person. I wanted no complex back-story, no real character development…just pure, unadulterated terror and craziness. It was a lot of fun to write, and I think it really did turn out to be a love letter. You’ve made it very clear that “flesh and blood” characters are of utmost importance in your writing. What do you mean when say you write these types of characters and why are they important to you and your writing? It’s crucial to have relatable characters that the reader—and the author—can easily imagine off the page. Even in the story I just discussed, “October Film Haunt,” in which I consciously stayed away from the importance of character arcs, the reader still has to care about the characters, what they do, and what they gain or lose. Antagonists, antiheroes and even the henchmen who die in the second scene should feel like real people…except, since this is horror we’re talking about, when they’re not actually people at all. When a story focuses on character and seeks a “depth,” that flesh and blood is all the more important. There’s no point in hanging curtains if there’s no window. Short fiction and short fiction collections seem to be taking the stage and leading the charge, especially within the realm of Weird fiction. What do you think is it about the short story or novella that draws the Weird writing crowd? Since Weird fiction relies primarily on the unknown intruding upon the known world—to simplify things—it can be difficult to sustain that sense of uncanny dread across the length of, say, a 90,000-word novel. Ambiguity is often the bread and butter of the Weird; that sense of awe and uncertainty is important to carry the fiction’s effect beyond reading. This isn’t to say there are no Weird fiction novels. It’s just that the ratio is skewed more toward its effectiveness as a short form. Horror typically works better than Weird fiction in novel form because its monsters are most often explained. There’s a clear path and intent: figure out the monster so that you can survive it. In Weird fiction, the “monster” is sometimes so inscrutable and vast (the universe itself or something so alien that the human mind can’t truly process it) that over the course of a novel, it becomes difficult to get away with that inscrutability. I also feel that short fiction is making a comeback in its own right, which is a wonderful thing. The novel is important, but there’s absolutely no reason for it to claim such a vast majority of the reading public. Short fiction can paint moods and tones and use forms and structures the novel simply cannot. Speaking of the Weird writing crowd, you are scheduled to be a guest at the inaugural The Outer Dark Symposium on the Greater Weird this weekend (March 25). Anything special planned for this event? My plans are essentially the same as with any other convention: go and have fun. We’re having a dinner with readings the night before the Symposium. It’s at 8:00 p.m. at My Parents’ Basement in Decatur, and though there is limited seating, it’s open to the public. And we are looking for weird and creepy things to do on Sunday, too, before everyone ships out. The best part of any convention is meeting and hanging out with people I usually only know on social media. They’re like family. Any interesting stories on how you discovered Weird fiction and what specifically drew you to this particular group of writers? It’s interesting to me—and a little embarrassing—how late I came to Weird fiction. I read horror as a kid but for some reason never explored it much beyond Stephen King. I have no idea how different I would have turned out if I’d stuck with it beyond my teenage years. But the darkness never left. I found it in other things. And when I finally, too many years later, decided I couldn’t put off trying to write fiction anymore, I reread some Stephen King stories and bought a copy of Ellen Datlow’s Best Horror of the Year, Volume Three just based on Amazon browsing. The latter book was a revelation to me. I discovered Laird Barron, John Langan, Tanith Lee, Stephen Graham Jones…it was a door opening, and soon I was an addict. These people thought about fiction the way I did, and I had no idea! I wrote my first story soon thereafter, and ever since I’ve been trying to pretend I knew about this stuff all along, even after admitting in interviews that I didn’t. Do you have any advice for those writers just starting out? There’s a post on my blog called “On Turning Five.” I wrote it last year to share my thoughts about what I felt was the first chapter in my career. It goes into more detail than I can here, but I shared six bullet points that I think are important for a beginning writer: talent (you gotta have some of that); time (use what you have and don’t worry if others have more of it); wisdom (rely on your own, seek others’); kindness (support other authors, pay it forward); persistence (keep doing it, keep fueling the fire of your passion to write in any way you can think of); and resiliency (there will be a lot of rejection—it’s as important a part of the reality as success is). Can you fill us in on what you’re currently working on? And where can our readers get their hands on your published works? I’m currently in the middle of my first novel. There’s some weird fiction, some horror, some literary sensibilities, and some ore from other mines. I have that Venn diagram taped over my desk with a thumbtack pressed into the center. As for my published works, my novella, “The Tired Sounds, A Wake,” has sold out forever, sadly, as it was a limited-edition pressing, though it will live again down the road in my next collection. Greener Pastures is available through Apex Book Company or Amazon and other online retailers. My blog has links to all my stories that aren’t in the collection as well. Can you give us five things you’re into at the moment that we should be reading, watching or listening to right now—past or present, well-known or obscure? Reading: Julian Barnes’ novel The Sense of an Ending. I’m reading it for the third time right now. It’s a very short literary novel that takes an uncomfortable look at memory and its reliability, both intentional and unintentional. Beautiful and unsettling. There’s a film version coming out soon, so now would be a good time to discover the book. Watching: I’m terribly behind on films. These days my partner and I are watching The Golden Girls in its entirety, and I’ve been having fun reliving my childhood—it was the last show my grandmother and I watched regularly together— and coming up with fake occult theories about Sophia and the girls. Listening: Mica Levi’s film scores. I listen to a lot of ambient, drone, and classical, and Levi’s work for recent films is wonderful to write to. UNDER THE SKIN and JACKIE are both great and very different from each other. And last, but not least, care to share anything weird and bizarre we don’t know about you already? This isn’t particularly weird, but I used to have a fairly profound fear of public speaking. For some reason, back in 2010 I got it into my head that I wanted to try amateur standup comedy, which is pretty much the opposite of what I do now. I did it three open-mic performances. It was utterly terrifying but fun—I can clearly remember the swelling panic in my chest—and I’m convinced it was the first step toward writing fiction, which was my other big fear. And while I still have that old fear of public performance in me, it did wonders for it, and it made me an advocate for those scared to put themselves out there: Just do it. Follow your dreams no matter what shape they ultimately take. You’ll be glad you did. 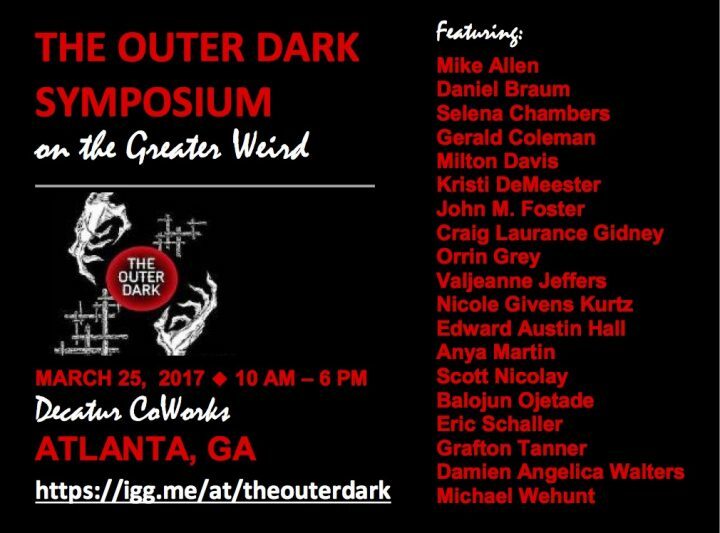 ATLRetro is proud to be a sponsor of The Outer Dark Symposium on the Greater Weird on Saturday March 25. Attending memberships to the symposium are $25 and limited to 50. A few are still available at press-time. Contact atlretro@gmail.com. There’s also a pre-party with author readings on Friday March 24 at My Parents’ Basement in Avondale Estates from 8-11 pm.